Wagner-Meinert provides complete planned maintenance programs to our customers' industrial and commercial refrigeration systems as well as mechanical/HVAC systems. Our planned maintenance programs are designed to give our customers peace of mind in knowing their equipment is performing at peak efficiency while costly breakdowns, and downtime, are reduced. These planned maintenance programs are designed to increase the life expectancy of the equipment and enable our customers to foresee and predict and equipment failure. We can provide planned maintenance on many types of equipment such as ammonia compressors, condensers, evaporators and make-up air units. Also, our service technicians are trained to provide planned maintenance services on HVAC systems, boilers, electronic controls, heat recovery and mechanical systems. For more detailed information about our planned maintenance programs and pricing, contact Dan Huelsenbeck at dhuelsenbeck@wmillc.com or call 260-489-7555. By using advanced computerized diagnostic techniques, Wagner-Meinert Engineers and Technicians can perform Vibration Analysis on equipment to determine bearing wear levels of many types of machinery. By performing Vibration Analysis, we can determine approximate equipment failure times to reduce or eliminate emergency breakdowns. There are four phases of bearing wear to any machinery. Earliest indications of bearing problems appear in ultrasonic frequencies ranging from 250,000 to 350,000 Hz. As wear increases, frequencies drop to 20,000 to 60,000 Hz. Slight bearing defects begin to "ring" bearing component natural frequencies which predominately occur in the 30K to 120K CPM range. Such natural frequencies may also be resonances of bearing support structures. Bearing defects frequencies and harmonics appear. When wear progresses, more defect frequency harmonics appear and the number of sidebands grow, both around these and other bearing component natural frequencies. Towards the end, amplitude grows and normally causes growth of many running speed harmonics. Discrete bearing defect and component natural frequencies actually begin to "disappear" and are replaced by high frequency "noise floor". By measuring frequency and amplitude levels in cycles per minute (CPM), wear levels can be determined by graphic analysis. 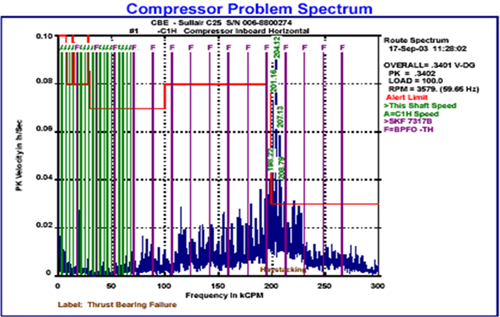 This type of graphic analysis provides accurate probabilities of potential equipment failures. This information is crucial in planning equipment down time for maintenance or rebuild and avoiding failures during production.